IoT (Internet of Things) is the big shift in information technology industry. According to Zion Research, the global market size of IoT, which was US$ 7.5 billion last year, will be nearly 4 times (US$ 27.38 billion) in 2022. At the same time if we talk of estimated IoT device installations, it will be in the range of 5.5 to 6 billion by the end of 2021. Recently Ovum’s IoT team came up with a very elaborate report “IoT: Opportunities in 2017 an Beyond“, which is highly recommended to read, has identified five major trends to watch in the IoT market in 2017-18. LPWA is Going Mainstream: Licensed spectrum low-power wireless access (LPWA) technologies are coming into their own in 2017, following the standardisation of several licensed spectrum LPWA technologies in 2016. This should open up IoT opportunities to a host of new industries, and enable applications in new domains, due to the lower cost of LPWA deployment. 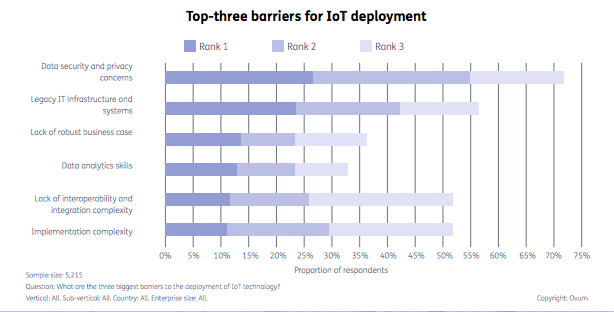 Service Providers are Diversifying Connectivity Offerings and Reaching to Developers: Enterprises are looking to vendors, service providers and systems integrators to support them in finding the right approach and the best technologies to get the job done, for IoT deployments. Securing IoT Becomes an Enterprise and Consumer Priority: IoT data and device security have become a primary focus for organisations considering IoT deployments., Data, network, and device security issues are of course a perennial concern for enterprises. Vendors and leading service providers are already gearing up (and partnering up) to address issues and breaches. Big Data and Machine Learning will Unlock New IoT Opportunities, as Processing Moves Closer to the ‘Edge’:There is a shift in enabling processing and analytics at the IoT network edge, minimising the need to transport large amounts of data back to the cloud or data center before triggering an action or alert. IoT’s Disruptive Impact will Drive the Growth of New ‘as-a-service’ Business Models: Transformational business models will develop in many IoT verticals over 2017- 2018, supported by big data and AI tools. The IoT is already enabling the growth of the sharing economy. To access the full Ovum Research, CLICK HERE. Very recently Inmarsat, a leading global mobile satellite communications provider, conducted a study focusing on enterprise application of the Internet of Things, and it revealed that IoT has become the leading technology for digital transformation and is the number one priority for 92% of organisations. Such findings indicate that we are going to witness significant benefits from the deployment of IoT technologies in the future. The benefits will range from better health, safety and productivity to agile business decision making. Is Chief Digital Officer (CDO) Just a Fad? With nearly 22 years of experience in Tech B2B media, Rahul comes with a distinct approach for nurturing the CIO & CISO communities. He has worked with CIOs & CISOs from across sections of industries and has an in-depth understanding of their unique information needs. Rahul is one of the rare media entrepreneurs with a distinct ability to balance between totally diverse functions of editorial and business. Rahul has held leadership roles at IDG India and 9.9 Media before starting Grey Head Media. Since the popularities of IoT continuously increasing across all industries; as a business owner or marketer they all should stay informed on the upcoming IoT trends in order to achieve sustainable and long-term growth.